In my previous post, I stated: Reality. You have Parkinson’s. Reality. If you have Parkinson’s, you have symptoms. What you decide to do about your Parkinson’s and your symptoms is a choice, and your choice is grounded in your viewpoint of reality. Let’s explore this further. Reality. 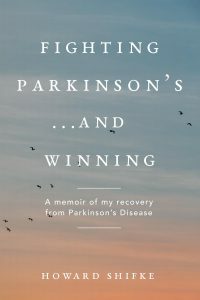 In March of 2010, I felt that I had stopped the progression of the Parkinson’s. I started working harder on the mental/emotional/spiritual healing. The more I fought my mind, the worse I got. In May of 2010, I was physically crippling myself for the simple reason that I could not forgive myself, accept myself, or love myself because my mind kept telling me I was not worthy. My mind was winning the battle with my spirit, my soul, my essence. When my spirit felt unworthy, my body responded in kind…crippling unworthiness of a body is what it showed me. Using the analogy from my last post, it is May of 2010 and I am in the pasture. Sitting on one fence is all of the neurological world and sitting on the other fence is me (apparently two places at once). The viewpoint of all of the neurological world is that this crippled-looking man needs to get on medications immediately to get him looking better and moving better…to improve his symptoms and his quality of life. The viewpoint of me looking at me is that I no longer had acid reflux, no longer had indigestion, no longer had urgent urination, no longer had constipation, that I had gotten back my sense of smell, that my fingernails were growing fast and hard, and that my eyes were bright and white instead of yellow and bloodshot. My viewpoint: healing and recovery. Reality. One crippled-looking man in the pasture and a bunch of people sitting on the fences. Everything else is a viewpoint. However, my viewpoint of reality helped change my future reality. I trusted that although my physical body was a mess that I was on the correct path of love, joy, acceptance, surrender, and gratitude. I never gave up faith! One month later, I was cured from Parkinson’s. My viewpoint of reality has not changed one iota. I have faith in each and every one of you. If you will accept the viewpoint of reality that your full recovery already is inside you, and that by doing the soul, mind, and body recovery program of the Parkinson’s Recipe for Recovery®, you will ignite the recovery inside to fruition and full recovery, then you, too, will change your future reality just as I did. What is in the past is in the past. Detach from it and let it go. What is in the present is reality. Immerse yourself in what is real in the moment. Your viewpoint of this present reality helps determine your future. What is your viewpoint of reality? It is your life. It is your choice. Look inside your heart and make the choice that feels right to you. I had the same symptoms you describe plus: oily skin, nightmares, headaches, heavy sweating, muscle and joint aches and fear. It all become less, or went complete away. Only tremor got a bit worse. Sooner or later I will make it too. Thank you so much Howard, for giving us lots of hope and strong belief we really need. Thank you Howard – when I am on my knees you give me strength to get up and keep going – and strength to question the medical model and keep going – and strength to believe there is a breakthrough waiting for me if I build my faith instead of my fear. Having a tough time just now fighting off the gremlins that make me shake and shake and shake and my foot dystonia claws and claws and claws – but then I think of Howard and the others who have recovered and say – I am fearless – I have abundance – I can be my own cure NOT the self fulfilling prophesy of doom preached by the medical model. Gratitude to everyone for sharing their recovery journey and gratitude to my husband who keeps the faith in the recipe strong – and love and gratitude to Howard. Thank you Howard, this post reminded me of all the progress I have made over the past year. I had a similar list of problems which have now got better. People say that I look well and I certainly sleep well now. I feel that I’ve healed on the inside and now I’m learning to accept myself just as I am. I’m grateful for your coaching Howard and for your guidance on the road to recovery. I know it can be done! Great post, Howard. In the state of gratitude, my heart is filled with joy. In this state, I can imagine the body that I want and imagine it over and over. So far, I have conquered constipation and hallucinations which is a side effect of a drug. I dare to keep dreaming of my future self. Thanks for you support and inspiration! For me, stress has been a big factor, and figuring out how to ‘fight’ it is key. I cannot run away from sources of stress because there is always more where that came from. I cannot fight stress fueled by anger and other negative emotions because that just feeds my own negativity, and then I’m right back where I started from. Dissolve stress when and wherever it arises with with the age old tools of love, joy, acceptance, surrender and gratitude, as per Howard. Just relax and let the healing energy of the universe pour in. Seems to work marvelously well! A very important, stress relieving, ingredient for recovery. Yeah, how can you go wrong with that?